(CNN) -- Zimbabwe's cholera outbreak has killed nearly 500 people, according to the World Health Organization. 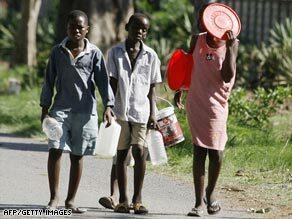 Children carry jugs and buckets to fetch water Monday in Harare, Zimbabwe. The Geneva-based body said Tuesday 483 people are now known to have died from the water-borne disease. However, doctors on the ground believe more than a thousand people have lost their lives. Health Secretary Henry Madzorera said the figures from the World Health Organization could be much higher as numbers are being underreported. He did not say by how much. Unicef says it plans on providing a month's supply of water treatment chemicals for the capital Harare where water supply has been cut off because the government of Robert Mugabe is unable to buy chemicals needed to clean tap water. Almost 12,000 people have contracted cholera since August in Zimbabwe, and the outbreak threatens to grow more dire and deadly. There was no running water Monday in Harare, the capital, according to the opposition Movement for Democratic Change. Residents there were digging shallow holes in their yards in hopes of finding water. In some cases, nearby holes served as latrines. Other residents were getting water from polluted rivers. "Just be strong. This will come to an end one day," MDC Vice President Thokozani Khupe told cholera patients while visiting the Beatrice Infectious Diseases Hospital in the capital Monday. At Beatrice hospital in Harare, bodies were piled in the mortuary, awaiting relatives to collect them. "We are receiving up to 15 bodies a day since the cholera outbreak. That is why we have started piling them like that. We cannot cope with the situation," a hospital official said. Cholera is a highly contagious disease that causes severe diarrhea and vomiting. It is curable, but because Zimbabwe lacks the drugs and doctors to treat it, the death rate there is 10 times greater than it is in countries where treatment is available, according to former President Jimmy Carter, who visited with officials in the region last week. The nation's four major hospitals have shut down, Carter said in a statement, warning the disease will continue to spread into South Africa unless action is taken. Khupe said some victims were traveling to Botswana and other neighboring countries for treatment. "This is now a regional disaster," Khupe said. The MDC issued a statement last week warning that conditions could worsen this month as the rainy season brings steamy downpours to much of Zimbabwe, especially the eastern mountain forests. The International Committee of the Red Cross said Zimbabweans should avoid digging shallow wells or drinking rainwater that accumulates on the ground. "Rainwater on the ground is easy to collect, making it a tempting source of drinking water. The problem is that it may be contaminated," said Sandra Eigenheer Fust, the ICRC's water and sanitation engineer in Harare. The MDC reported Monday that many of the nation's doctors and nurses have gone on strike because of poor salaries. Even if they were being paid adequately, the MDC said, many would refuse to work because there are no drugs for patients or protective clothing for health workers. "Some of the patients admitted at the centers are health workers who contracted cholera due to lack of protective clothing," the MDC statement said. While the MDC has blamed the humanitarian crisis on its political opponents, the ruling ZANU-PF has called the accusations unfair and says it is doing all it can to battle the outbreak. "The government is very committed to ensure that the humanitarian crisis is addressed. It would be wrong for the MDC to blame it on the government," Foreign Affairs Minister Simbarashe Mumbengegwi said last week. One such "don't," according to the paper, is taking part in "mass feedings." And on Monday, Zimbabwe's health minister implored citizens to stop shaking hands. "Although it's part of our tradition to shake hands, it's high time people stopped," David Parirenyatwa told the Herald. Zimbabwe also has tried to import chemicals to treat its water, but with the nation's economy in shambles, it has been unable to do so. "Our supplies ran out late Saturday, and we had not paid on time," said a government official who asked to remain anonymous for security reasons. "We no longer have credit lines because of our bad record, so our suppliers in South Africa demand payment first." Unemployment in Zimbabwe is about 90 percent, and the official inflation rate is 231 million percent, though unofficial estimates suggest it's higher. The economic turmoil is compounded by the nation's political tumult. MDC leader Morgan Tsvangirai won the most votes in March elections but dropped out of the subsequent runoff, citing violence against MDC supporters. Tsvangirai and President Robert Mugabe of the ruling ZANU-PF signed a power-sharing deal in September, but it has failed to take effect as the MDC has refused to form a national unity government, accusing Mugabe of taking all the key ministries. Last week, Carter called Zimbabwe "a basket case" and blamed the cholera outbreak and other turmoil in the nation on "the poisonous effects" of the Mugabe regime. Also last week, a group of Harare residents, led by Arthur Taderera, filed a lawsuit against the Zimbabwe government, saying, "Due to their lack of diligence and constant supplies of clean water to my place of residence, diseases like cholera surfaced and people are dying." During her Monday hospital visit, Khupe asked the government to put politics aside and called on the international community to send food and medicine to help mitigate the crisis. "People should stop politicking about this situation as it has reached unprecedented levels," she said, according to an MDC news release. "ZANU-PF should get out of its denial mode and admit that they have no capacity so that those that can help can come in as a matter of urgency."